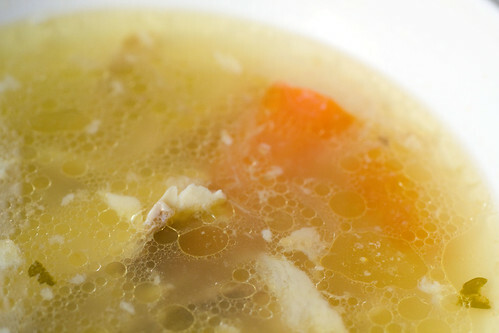 My mother-in-law, Bonnie, makes a wonderful chicken soup, also known as Jewish penicillin. She uses a ton of vegetables, more than any other recipe I’ve ever seen for chicken soup, which results in a much sweeter soup, but it’s a natural sweetness. The fresh dill also brightens it giving it a light feel. On most special occasions, this is served with a matzoh ball, and that in itself is enough to celebrate. 1. 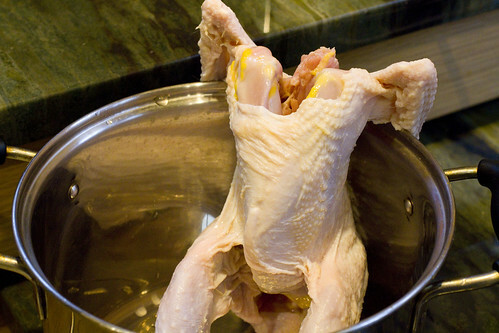 Place chicken pieces in a large pot and cover with enough water to cover 1 1/2″ over the chicken. Add the vegetables and herbs. Sprinkle with salt and pepper. Bring to a boil. 2. As the soup cooks, clear off the schum occasionally (about 3 to 4 times throughout) and discard. 3. Cook soup on medium low for 1 1/2 to 2 hours. Adjust seasoning as it cooks. 4. Serve with egg noodles, matzoh balls, and dill, if desired. I don’t know if I’ve ever had chicken soup in an Italian restaurant but I could have guessed that it would include tomatoes, when none of the others do. This recipe is an adaptation from Lidia’s Italian-American Kitchen, and she uses some turkey wings for her own twist. This recipe is a lot of meat, bone, and aromatics vs. the amount of water. The result is a very richly flavor and collagen filled soup. She uses rice for a quick soup to serve. 1. Rinse chicken and turey in a colander under cold running water and drain well. 2. Place them in a 10 quart pot. Add the water and bring to a boil over high heat. 3. Boil for a minute or two, allowing the foam to come to the surface. Skim the foam and turn down to a strong simmer. Cook 1 hour and skim occasionally. 4. Add the rest of the ingredients except for salt. Bring to a boil and then adjust back to a simmer. Cook, partially covered, for 2 to 3 hours, skimming fat occasionally. 5. 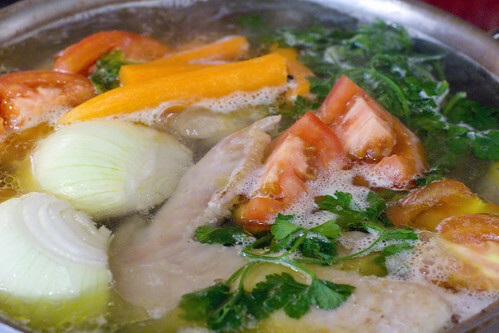 Strain through a fin sieve for a broth or serve with pieces of chicken and some cooked rice. My mom uses fowl for chicken soup. Notice that they don’t have the plump breasts regular chickens do. This easy 3-ingredient (no including water) soup is just the fowl, ginger, and dry aged ham. Those are the flavors you get, pure and simple. My mom serves the soup with the fowl pieces which have an interesting snap to the skin and meat. When we got sick as kids, my mom would give us this chicken soup with some Chinese noodles added for a light meal. 1. Wash fowl and chop into 16 pieces. Discard tail. Place in a medium sized pot and cover with cold water. 2. Add ginger and bring to a boil. Turn down to a simmer and cook for about 90 minutes. Add ham and cook for another 30 minutes. Serve. This South East Asian version is adapted from Hot Sour Salty Sweet, by Jeffrey Alford and Naomi Duguid. It is similar to the Chinese Chicken soup in that it uses ginger. There are more ingredients here, and most interesting to me is the finishing with fish sauce. Rice noodles can be added to make it a meal. 1. Rinse the chicken. Put in a large heavy pot and cover with cold water. Bring to a boil, then reduce to a simmer, skimming off any foam on the surface. Discard foam. 3. Set aside meat for another purpose and strain the broth through a sieve, into a seal-able container. Let the broth cool completely. Cover and refrigerate. 4. 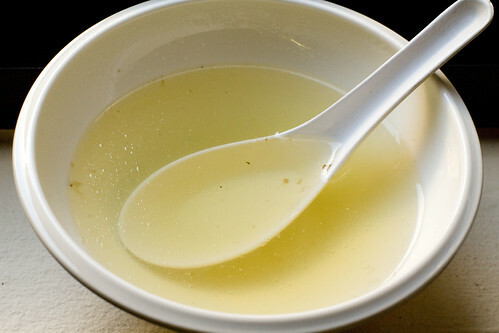 After a layer of fat has solidified on the top, skim it off and use the broth as you wish. Heat and season with salt and/or fish sauce if you want to have it as chicken soup. This recipe is the basis for Michael Psilakis’ Avgolemeno (from How to Roast a Lamb) and it is everything you imagine a simple chicken soup to be. The roasting of the chicken gives this a deeper flavor than most, which makes it feel more substantial. With the added orzo, it’s a one-bowl lunch. I also like that the vegetables are chopped up. 2. Separate the legs from the chicken. Remove the skin and discard. Place the chicken pieces in a roasting pan and season with salt and pepper. Roast for 1 hour. 3. In a large pot, heat the two oils. 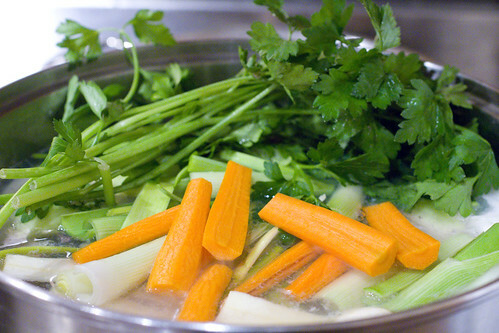 Add the carrot, celery, onion, and stir until softened, but not browned, 3 to 5 minutes. Add the bay leaves and thyme. Deglaze with white wine and stir until it completely evaporates. 4. Add the roasted chicken carcass (not legs) and season generously. Cover with water by two inches. Bring to a boil, then reduce to simmer and, cover and cook for 1 hour. Add the legs and simmer for another 45 minutes. 5. Skim off any skum and fat (if you prefer). Lift the chicken pieces out and cool until you can handle it. Pull the meat off and return it to the soup, discarding bones. 6. 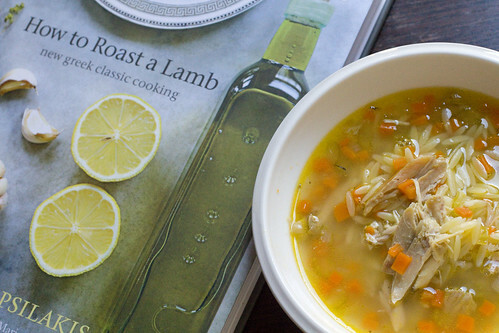 Bring the soup to a boil and orzo. Cook until orzo is cooked through, about 8 minutes. Serve. posted by jessica	at 05:06 PM	Filed under Basics, Recipes. You can follow any responses to this entry through the RSS 2.0 feed. Both comments and pings are currently closed. I learned my chicken soup recipe from my mother, who passed on something akin to a Jewish/Italian hybrid with an unexpected Mexican twist. We include chickpeas and zucchini, and then squeeze lime into the soup before eating. I love all of the options you’ve outlined in this post! This is a really nice post. So many cultures, similar soups. Food is really a transnational thing. Cool! The Greek version looks wonderful. I love this post and all of the effort you put into it. 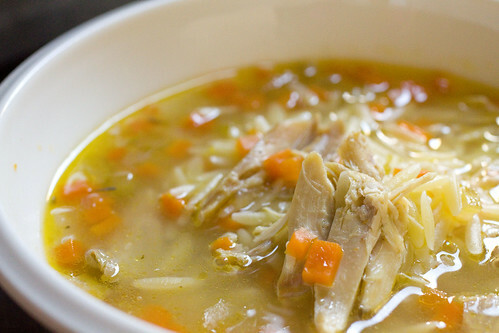 It is so interesting how every culture has some form of chicken soup. It is definitely a testament to its use as a comfort food! EMC, sounds delicious and nutritious.., don’t mean to sound like an 80s commercial. Hope you feel all better soon! Joanne, it took a long time but I got the benefit of having chicken soup around all winter this year and I really enjoyed that. I may do a soup series every winter. Fun post! We all have our favorite version. 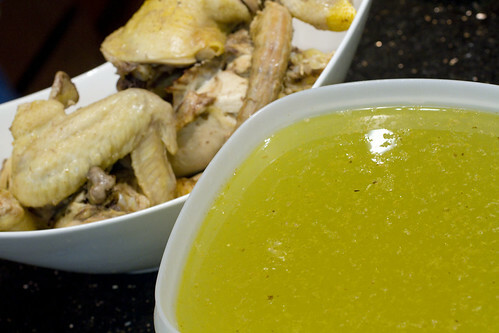 My mother made her own chicken broth (using,among other things, chicken feet) and then would make an egg drop soup. I still make it! I have the “How to roast a lamb” book, so I’ve got to try this one. Otherwise I like the name Jewish Pennicilin… When I read this, I instantly feel better! Wow that’s a lot of chicken soup! Great post. Thanks also for the inspiration of the Stuffed Peppers with Black Bean Sauce, posted about it today. Wow, this is a fantastic post. Amazing detail and pictures – making me hungry right now! 🙂 Also, couldn’t be better in terms of timing since I’m feeling a bit under the weather. Thanks everyone! Forgot to mention to freeze some so you always have some when you most need it! Dave, hope you’re all better already! 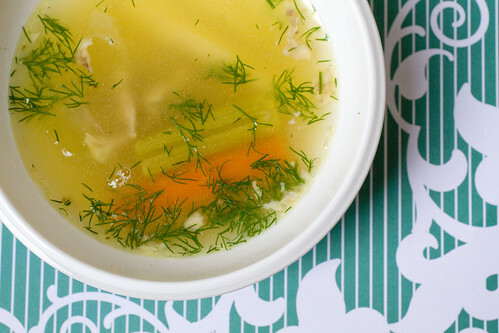 Have been looking for a GREAT chicken soup recipe for decades. This has them all in one place, and I am grateful to you for compiling them. The Jewish recipe sounds most like my Grandmother’s which I often yearn for. I wish I had gotten her recipe before she passed, but the Jewish one here sounds just like it. Thank you! Don’t forget the matzoh balls!